According to local authorities, the death toll due to the May 2 and 3 dust storm in Rajasthan and Uttar Pradesh is slated to rise. A massive dust storm wreaked havoc in Alwar, Dholpur and Bharatpur districts. The storm has claimed 125 lives till now and of these, 73 have died in Uttar Pradesh and 36 in Rajasthan. Most of the casualties happened due to trees getting uprooted, lightning strikes and collapse of walls of mud huts. People who were sleeping were caught unawares by collapsing walls. While the storm has been declared a disaster as per the State Disaster Response Force norms, the Jaipur Indian Meteorological Department (IMD) says that it is very difficult to predict such dust storms. Ashok Sharma from IMD, Jaipur told Down To Earth, “A low pressure trough has been created from the borders of Punjab, Haryana due to pressure gradient which extends till Odisha.” The current dust storm conditions will continue in the next few days, according to IMD. The relentless heat wave conditions in the past few days added to the situation. The presence of moisture has enabled the winds to carry rain along which has created the current dust storm conditions. Add to these lightning strikes which were also rampant causing direct deaths and damage to property. Although dust storm conditions are associated with coming rainfall in the state, they have become a source of misery in the past 10-12 years. In 2006, a series of dust storms had brought an unprecedented amount of rainfall causing a deluge in the region. Barmer district was inundated with 750 mm of rainfall in a week. 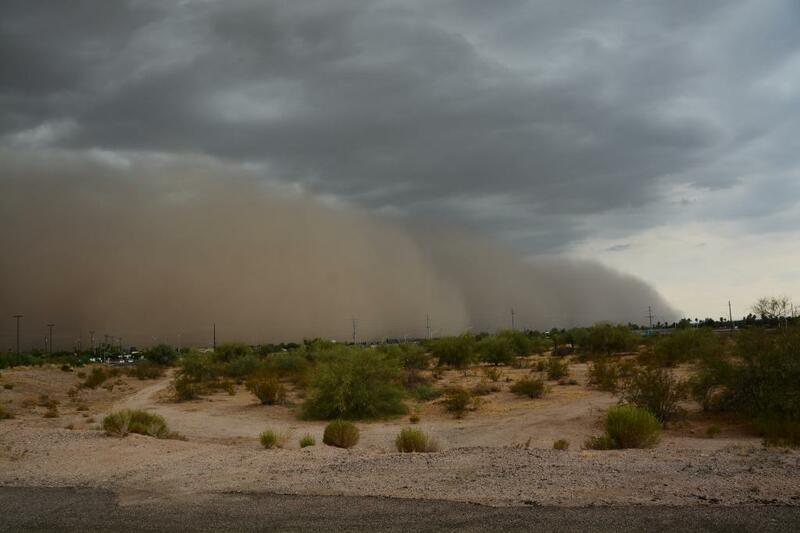 The cause of this extremity of rainfall post dust storms had been linked to climate change by experts. Rajasthan has recently seen other weather related extreme incidents. In March, a series of hailstorms destroyed crops in Alwar and Sikar districts. Many rabi crops had been destroyed due to the event. Three weeks ago, the same region of eastern Rajasthan had seen a spate of heavy rains and thunder storms. On April 11, Alwar and Bharatpur received 40 mm and 15 mm of rainfall respectively, 900 per cent and 400 per cent of the normal rainfall during this period. 11 people in Dholpur had died because of intense rainfall, mainly falling trees and wall collapse.